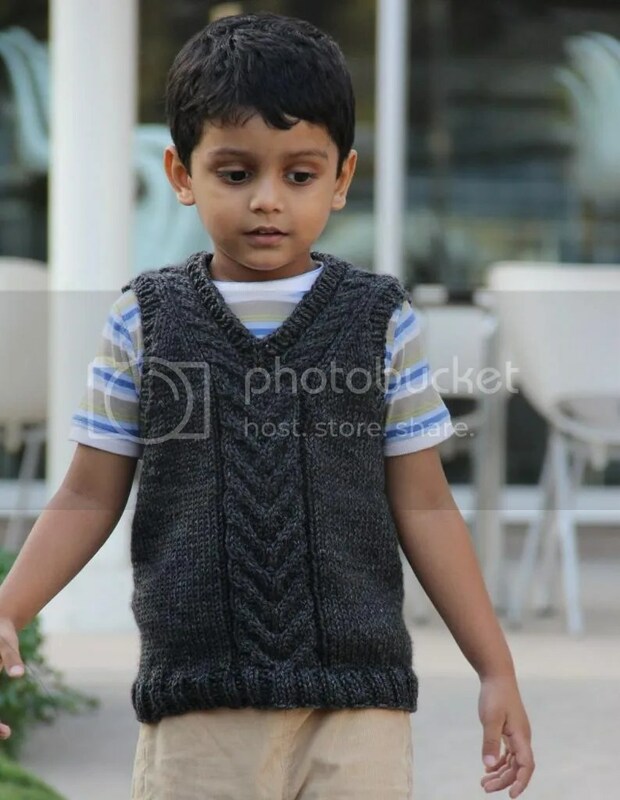 I am almost done with this cable vest for boys and girls and I am all set to release it. Except I don’t have a name for it yet. Yes, this is the vest I have an urge to name ‘Thirteenth Time Lucky’ because it took me 12 attempts to get this right. Or should I name it ‘Phew!’? Humor apart, no matter where I look for inspiration, I seem to draw a blank, so I am turning to my friends and blog readers to help me out. I love word plays, so the name could be a play on the cable (staghorn) or the technique (cable) or anything that you think which suits the vest. Here is one of the photos from the shoot. Not the best, but I don’t want to reveal the best until the release. Just leave a comment with your suggestion(s). Two winners will receive a copy of this pattern, sent to them on Ravelry or emailed to them. The first winner will be the one who suggested the winning name and the second winner will be randomly picked, so even if your suggested name does not get picked, you still stand a chance to win. 4. Contest ends on Jan 15 2013. Put on your thinking cap and comment away. Really like the simplicity and timeless nature of this design. I di\’dnt know where to find this info then kaboom it was here. Chasing Chevrons – because the v shape reminds me of the chevrons you see on the roads – one chasing the other! The model is adorable and I love the pattern – lovely detail but simple as well. Wow what a cute vest! Being a HUGE cricket fan, this vest immediately brings to mind the classic tailoring of traditional cricket vests with a slight twist; the staghorn cabling – I love it!! I propose the name “Staggy Wicket”; a word-play on the phrase sticky wicket and the gorgeous staghorn cabling that you have used. Personally, I’m a terrible cabler; but this vest is inspiring me to knuckle down and grab that cable needle by the horns (pun totally intended). My good cricketing friend (and team captain) has a tiny baby boy who simply NEEDS this vest in his closet! I have decided! If I’m not lucky enough to win a copy of the pattern, I will definitely be buying it! Boy meets vest….it is a handsome vest and a handsome boy. Swallowtail vest. …. looks like little swallows heading south when they migrate. Well, since Staghorn is a fern, how about Fernicious? Y cable. The shape the cable make on the vest. I really like Yest best. I also just thought of Ivy League to add to my list. As other’s have said, the cable pattern looks like the chevron of flying birds. Also, to me, vests are transition garments that are worn through the changes from fall to winter and and again as winter changes to spring, during the time that birds are migrating to and from. The first thought was steel staghorn… Something about the color seemed to make me think of steel. I can imagine this would look awesome in a steel blue. I like the idea of playing around with words to name it after the 12 attempts. How about “Dozenth Development”? I love Yearling Vest from above. I am gno good at naming… Perhaps Chevron Sophisticate? Staghorn Split Vest—because at the top the Staghorn Cable does in fact split up toward the collar part, and because the cable split’s the front of the vest up nicely). Y Knot, Sophisticato, Cavi; The pattern is lovely and the model is super cute.